Although Obedience and Rally are two different sports they are related to each other’s. Both sports build off each others skills. Many of the skills preformed in Rally also help to improve your dog’s ability to preform skills for competition Obedience and visa versa. 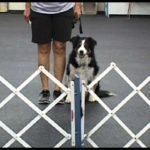 Using positive and creative training techniques to teach skills and exercises required in the sports of Obedience and Rally will produce a dog with a happy and eager attitude that will be apparent each time you enter an Obedience or Rally ring. In the sport of Obedience, pivots with your dog are generally preformed for the article and glove exercises. In the sport of Rally, pivots occur in a number of signs that can be performed during a run. “Call to Front” Important aspects of the Come to Front include being directly in front of the handler when called and in heel position after the finish. 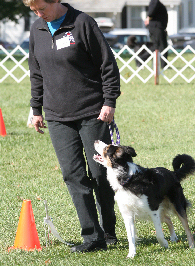 While heeling, the handler stops forward motion and calls the dog to the front Position (dog sits in front and faces the handler). This exercise is similar the Retrieve on the flat, except that dog must jump a solid jump (a high jump), retrieve a dumbbell, and return over the jump to the handler. 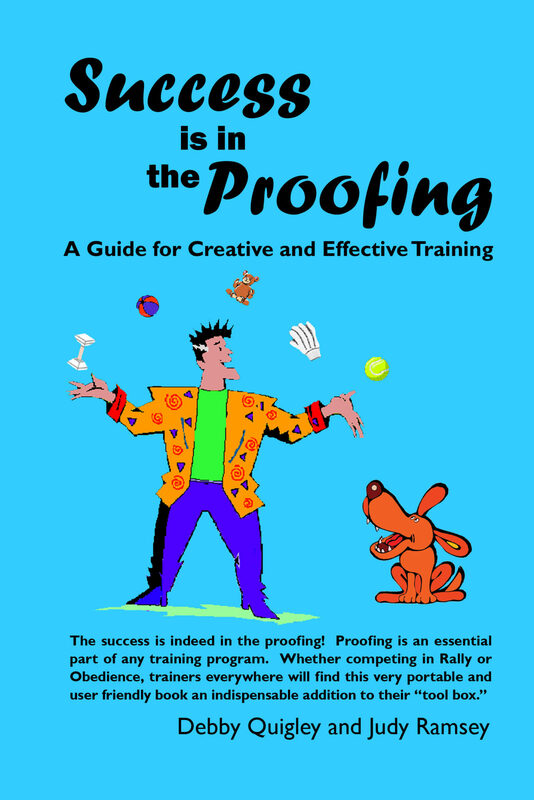 Because your dog is returning over a high jump, my techniques teach your dog not only to correctly preform the Retrieve over the High Jump but also to do so in a manner that develops confidence in jumping and correctly preforming this exercise. 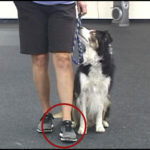 This exercise begins with the handler and their dog in heel position in front of the broad jump. The handler leaves their dog and walks to the side of the broad jump then commands their dog to jump. As the dog is jumping the handler pivots to face the dog. Sounds simple doesn’t it? However, this is probably one of the more difficult exercises and skills to teach a dog. 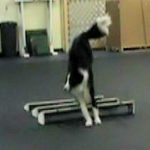 The board jump techniques teach both the handler and their dog not only how to preform the exercise but also create confidence and eagerness in their dog that is apparent each time the preform the broad jump exercise. The principal features of this exercise are that the dog stays until directed to retrieve and that it goes directly to the designated glove and retrieves it promptly. In this exercise the handler will provide three gloves that are predominantly white. Handlers will stand with their backs to the unobstructed end of the ring midway between and inline with the jumps. The dog will be sitting in heel position. The judge or steward will drop the gloves across the end of the ring while the handler and dog are facing the opposite direction. One glove is dropped about 3 feet in from each corner, and the remaining glove is dropped in the center, about 3 feet from the end of the ring. On the judges order, the dog shall retrieve the glove designated by the handler. 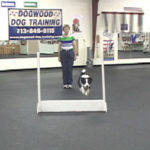 When preforming a Go-Out, the handler with their dog stand in heel position in the center of one side of the ring. The handler will command and/or signal their dog to go forward at a brisk trot or gallop to a point about 20 feet past the jumps to the other side of the ring and sit. Teaching go outs in a fun manner with motivational methods assures a fast and straight Go-out from your dog. There are two jumps set 18-20 feet apart. One jump is a High jump while the other is a Bar jump. 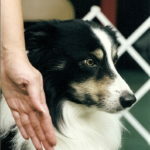 After the Go-Out and while the dog is on a sit the handler will indicate to their dog which jump their dog is to go over. This will happen two times jumping so that at the end, both the bar and high jumps are jumped. 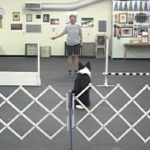 The Directed Jumping Class is taught in such a manner that your dog will gain confidence going over either jump regardless of the distraction or the environment.